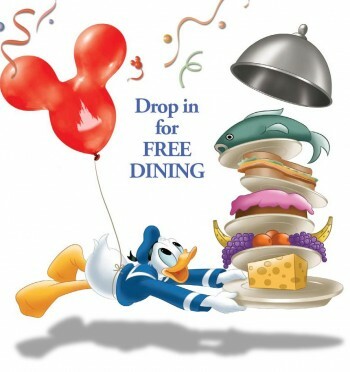 It’s finally here – free dining has been announced for select dates this fall at the Walt Disney World Resort. Guests must book at least a 2-day Magic Your Way ticket with Park Hopper and/or Water Parks Fun and More in addition to booking at least a 3-day stay at a Walt Disney World Resort hotel. Hotels excluded from this offer include: campsites, Bungalows at Polynesian Village, Grand Floridian Villas, Bay Lake Tower, 3-bedroom Villas, Port Orleans French Quarter, and Little Mermaid rooms at Art of Animation. Rooms at Port Orleans Riverside are only available with free dining through October 1. Guests at value resorts receive the quick service dining plan for free, while guests at the moderate, deluxe, and deluxe villa resorts receive the standard dining plan. Value resort guests can upgrade to the standard dining plan by paying the difference in price, while guests at the moderates, deluxe, and deluxe villas can upgrade to the deluxe dining plan by also paying the difference in price. The free dining packages must be booked by July 8. Disney also announced a room-only discount for this fall. Guests can save up to 25 percent on rooms this fall beginning August 26 through November 5. The “back-to-school” room discount will save guests up to 25 percent on rooms in deluxe resorts and deluxe villas, up to 20 percent at moderate resorts, and up to 15 percent at value resorts. For a complete breakdown of room discounts visits the Disney Parks website. Rooms for this discount can been booked through August 31.